I’m a believer in the age of the digital book. I was one of the first people in my circle to have a Kindle, and lately I find myself straying to the color Nook displays at our local Barnes and Noble in Westport (http://store-locator.barnesandnoble.com/store/2864). One of the things I like about these e-books is the way I can read one 10 minute story on the go – on my iPhone. It means that I’m never bored when waiting in the doctor’s office, in line at the supermarket, or when traveling. Tessa Smith McGovern, Writer, Founder and Editor of eChook Digital Publishing. Photo: Katherine Hooper. So when I heard about a new app designed specifically for I-phones, I was eager to get hold of it. The company who developed it is called eChook (http://echook.com/ ) and its founder, Tessa Smith McGovern, is a Westport resident and award-winning writer. Her first app publication was a collection of linked stories called London Road, and following the success of that, she decided to produce a series of apps, highlighting different forms of short stories. Rogue's gallery of authors at the launch Authors L – R: Ina Chadwick, Gabi Coatsworth, Tricia Tierney, Rebecca Dimyan, Leslie Chess Fuller, Helen Rafferty, Nina Sankovitch (author of “Tolstoy and the Purple Chair”), Christina Thompson (author of “Come on Shore and We Will Kill and Eat You All” and editor of Harvard Review). Photo: Katherine Hooper. Last Tuesday night saw the official launch of the latest in the series: the first Memoir collection, featuring 11 stories. These are a terrific value at 99 cents per app and I’m not only saying that because one of the stories is mine… Since the London Road stories were launched, the App has been made available for a number of platforms, including the android-based e-reader tablet the Nook, Kindle, iPhone, iPad and iPod Touch, and Android phones as well. 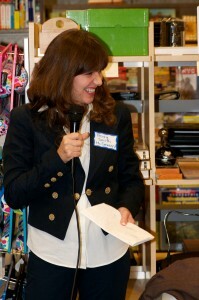 Tricia Tierney of Norwalk, ( triciatierneyblog.com/) the community events liaison at the store, is a writer too, and last Tuesday she was in the line-up of writers telling a little about their stories. Also present were a standing room only crowd of writers who came to meet the authors and doyens of the publishing world (see photos at right), some of whom had come from as far afield as Boston and New York City. 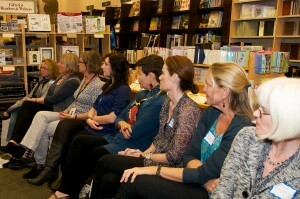 These were generous with their time and advice at the networking session which followed the launch. eChook is planning a second volume of memoirs and also holiday stories. Writers among my readers can find the submission guidelines at eChook’s website. As I said, I love the digital book, and the whole digital media publishing world. How about you?